They are called “rib-eyes from the sky,” the flocks of sandhill cranes that annually wing their way down the Central Flyway into Oklahoma, calling rhythmically with their eerie guttural sounds emitting from high above. For Edgar Hamm, co-operator of “Hamm’s Sportsman’s Oasis” guide service (580-335-1892; www.hammsoasis.com) in the Frederick, Okla., vicinity, that’s certainly a true statement. In other words, add flour tortillas, onions, bell peppers, salsa and a little guacamole and you have got a fowl-feast indeed. Of course, the primary ingredient for this fajita feast is a sandhill crane or two on the game strap, a collection process that is easier said than done.To that end, the Sooner State may admittedly not be the Central Flyway’s best spot to chase sandhill cranes since the U.S. 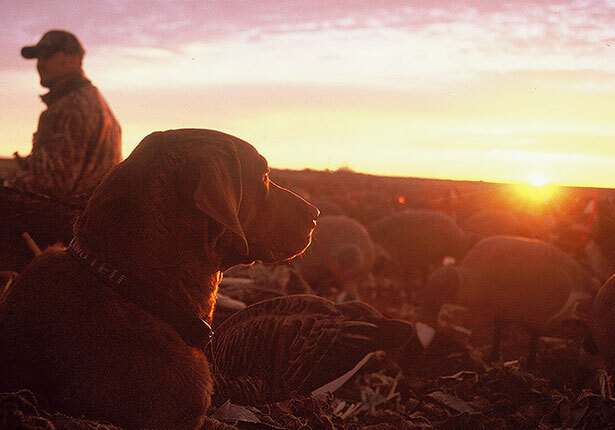 Fish & Wildlife Service's most recent estimated retrieved harvest figures are low in Oklahoma. Especially when compared to Texas and North Dakota where several thousand birds are harvested by hunters each year. In contrast to those figures, in recent years the retrieved harvest total in Oklahoma has been much smaller, including 808 sandhill cranes in 2011; 940 birds in 2010; and 737 sandhills in 2009.That said, there is still plenty of sandhill crane hunting opportunity out there to the west of Interstate 35 where the migratory species can legally be hunted in Oklahoma. One of the better spots in the Sooner State is in the southwestern region in the red dirt country not far from Frederick. 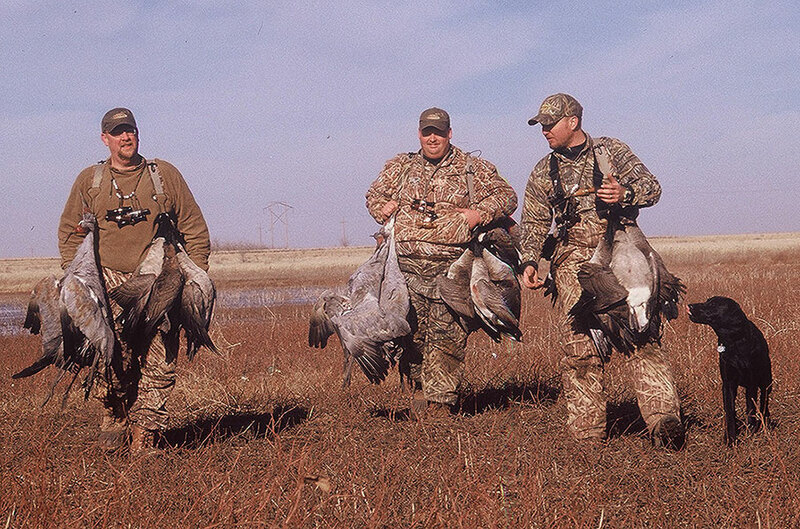 Even so, if you want to hunt sandhill cranes, you’ll need to accept a few facts. To start with, the more inclement the weather is, the better off a crane hunt has the chance to be according to Hamm. A recent spell of near record cold temperatures for mid-November and an early season snowfall in western Oklahoma was a prime time to be afield. Why is that? Because sandhills will be forced to move around more to feed in conditions where they can’t see or fly quite as well. Another fact hunters must accept is that while some sandhill cranes are taken as incidental game harvested on duck and goose hunts, most are bagged on outings where sandhills are the primary targets. That fact might help to at least partially explain the low harvest totals in the state since hunters need to have a specialized decoy spread consisting of plastic sandhill crane decoys, wind socks, or even mounted birds. What about blinds? Hamm has found that the lay-out style blinds so common to goose hunting these days often don’t work very well on wary-eyed cranes. As for what to shoot from such hiding spots, Hamm uses the same set-up – a 12-gauge shotgun that shoots three-inch magnum loads of BBs – that he uses on Canada geese. In terms of calling, while there have been some good commercial sandhill crane calls on the market like the Model 1175 made a few years ago by Sure Shot Game Calls (409-962-1636; www.surehsotgamecalls), Hamm is convinced that a successful hunt is more about finding some choice real estate. How do you find that preferred location? By scouting for areas that provide the crane’s daily need of food, water and a secure roosting site. Such locales range from feeding areas in green winter wheat fields (or occasionally, a harvested peanut field) to roosting and watering areas along the Red River or on a larger body of water. In the nearby Texas and Oklahoma panhandles, the birds will often roost on small playa lakes that dot the region. “You’ve (got to) scout the afternoon before you hunt (the next day),” said Hamm. Hunters must also pay close attention to details when sandhill crane hunting: i.e. remaining motionless; keeping your head down; wearing camouflage that matches your surroundings like Realtree's Max-5 pattern; wearing face masks and gloves; picking up empty shotgun shell hulls; etc. “Blink your eye once and they'll see it,” Hamm said of these birds with tall legs and wingspans of more than six feet. Speaking of eyes, Hamm says that due to the sandhill crane’s dagger like bill, he will not use a Labrador retriever on a crane hunt due to the risk of a wounded bird causing eye damage to a valued canine hunting companion. So what’s the bottom line on Oklahoma sandhill crane hunting? Well, getting a limit of “rib-eyes from the sky” can be a tough proposition anywhere in the Central Flyway where the birds are legal to hunt, Oklahoma included. But when you do bag a limit of these big birds, it just might be one of the best – and tastiest – waterfowling experiences that a wingshooter can ever experience. Editor’s Note: The 2014-15 sandhill crane season began on Oct. 18 in Oklahoma (west of I-35, the only legal portion of the state where the birds can be hunted) and continues through Jan. 18, 2015. The daily bag limit is three and hunters are required to have necessary state licenses, waterfowl stamps (both state and Federal varieties) and a free federal sandhill crane hunting permit. For more information, visit the ODWC Web site at www.wildlifedepartment.com.